But there is another “V” word in the Allegrini wine orb: Vermentino. It’s the grape used to craft the only exported white wine in Allegrini’s red-dominant lineup – Solosole – which is winning its own acclaim among the winery’s impressive Super Tuscans from Bolgheri and Valpolicella wines from the Veneto. Signora Allegrini, CEO of the $1.8 billion enterprise that bears the family’s name, radiates with excitement when describing Solosole. It’s the outgrowth of an adventurous project she launched in the mid-2000s in Bolgheri, a tiny hamlet located along Tuscany’s western coast touching the Tyrrhenian Sea, and the development of her Poggio al Tesoro (hill of treasure) estate winery in 2002. Initially, it wasn’t so easy to convince others of the white wine prospects. Afterall, Bolgheri is the 1970s birthplace of the iconic Bordeaux-style Sassicaia and the Super Tuscan phenomenon that spread throughout Tuscany. Big, bold red made from native and international grapes were the rage. White wines, which once ruled the broader Bolgheri DOC appellation (a single Bolgheri Sassicaia DOC subzone was created in 1992 for the famous wine), were largely forgotten. But Marilisa, buoyed by her late father Giovanni’s innovative drive and her own intuition, was convinced the right white grape could thrive in Bolgheri’s diverse pebbly soils, rolling hillsides, and sun-drenched conditions. Vermentino was Allegrini’s choice of grape, and eventually her agronomist settled on a clone from Corsica that ripens fully and retains its acidity. Green-harvesting, in which the vines are reduced by 50 percent of their leafy growth, increases energy and nutrients absorbed from the soils to the grape, she said. Also, Solosole undergoes no oak aging. It ferments in steel tanks and concrete vats, underscoring Allegrini’s vision for a clean, authentic Vermentino. The 2017 Solosole sampled was so fragrant in the glass that I couldn’t help but to continue swirling it under my nose. It reminded me of summer and sitting outside amongst perfumed flowers. On the palate, it exhibited bright acidity, freshness and concentrated citrus, pear, and stone fruit flavors. In my view, though, Solosole stood out for its elegantly smooth, round texture and baking spice nuances. Signora Allegrini said Solosole is built to improve for several years in bottle, although I found it hard to believe anyone tasting this wine would pass on the temptation to enjoy it now with its gorgeous attributes. Solosole is available in most Massachusetts and New Hampshire wine outlets (It’s on sale across the border through the weekend for $19.99 (regularly $22.99). Of course, it goes without saying that the Allegrini name has remained synonomous with Valpolicella since the 16th century. Some of their best reds (outside of their highly acclaimed Super Tuscans in Bolgheri) are made at the family’s Fumane Reanissance estate – Ville della Torre – located just north of Verona. It is here that Valpolicella Della Amarone Classico Superiore ($94 suggested retaill price) serves as a benchmark for excellence and Palazzo Delle Torre ($17.99), a single-vineyard “baby Amarone”, is acknowledged to be one of the consistently best medium-priced wines in the world. Marilisa Allegrini, CEO of Allegrini wines, has relied on imagination, innovation and intuition to build the family business into a global success story. I tasted both wines, including the limited-production La Grola, with Signore Allegrini and several wine reviewers. What follows are a mix of our impressions. Palazzo Delle Torre Veronese, $17.99 – I’ve written a lot about this wine lately, noting it has been named to Wine Spectator’s Top 100 List in six of the past 10 years. The Allegrinis have expertly found a way to soften the firm tannins in this Corvina and Rondinella blend. A small touch of Sangiovese is added to the mix for cherry taste and structure. The Allegrinis’ appassimento process – the air-drying of grapes – in their modern production facility prevents poor ventilation, and the botrytis fungus (Some producers still dry their grapes on wooden mats left in outdoor lofts. This traditional method risks disease from the varying external elements.) Unlike Amarone, Palazzo Delle Torre undergoes a partial appassimento. It’s second fermentation relies on pouring the wine over 30 percent percentage of dried, raisinated grapes, rather than the leftover Amarone pumice. This adds to freshness and longevity. But it’s the fruit that counts. Forty years ago, Signora Allegrini said her late father Giovanni made his only trip to California and saw how vintners improved fruit quality by focusing on producing healthier, more productive grape clusters hanging on the vine. He eradicated the overhead, canopy-styled Pergola Veronese vine-training system for the lower double guyot trellis method that shoots out horizontal canes. It allowed more sunlight and energy to reach grape clusters, which increased by volume and ripened equally. “It was considered revolutionary at the time and he was criticized,” explained Signora Allegrini. “But if you go through Valpolicella today today you’ll see 50 percent of the vines are planted as he did it in 1979.” Palazzo Delle Torre is a flattering, silky wine of black cherry fruit and vanilla spices. I highly recommend it. La Grola Veronese, $29.99 – This is a luscious, intense red of Corvina and Oseleta grapes that releases an abundance of black cherry, tobacco and espresso traits. The deep purple color is stunning. This was my first taste of this savory wine and it won’t be my last. Signore Allegrini said the bigger berried Corvinone grape will likely supplant Corvina in the future. It provides higher tannins and, through the appassimento process, adds structure, body and meat-savory notes. Valpolicella Della Amarone Classico Superiore 2014, $74.99 – I don’t like syrupy Amarone. Allegrini’s signature red wine is just the opposite: It’s made in a rich, exhuberant, and approachable style that places Amarone on the dinner menu for osso buco, steaks and pasta dishes with meat sauces. As Signora Allegrini explained, traditional Amarone was a bit harsh to drink when young. It needed time in the bottle to soften and was identified as a wine for drinking after a meal (vino di meditazione) like port. 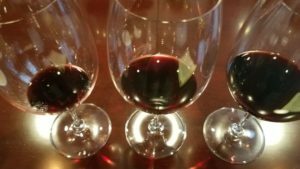 But the Allegrini Amarone – supple, silky, full-bodied and complex in dried fruit and mocha flavors – is neither overly extracted, alcohol driven, or designed for exile in the cellar. Signora Allegrini said, “The style we make is wine that you can enjoy with meat, the main course, steaks and very different kind of dishes that are easy to make … You can even enjoy it with barbecue.” I found the 2014 vintage exquisitely balanced, provocative and full of finesse. While Allegrini Amarone can cellar for a few years and get better I, for one, will not sacrifice today’s pleasure for tomorrow’s treasure.